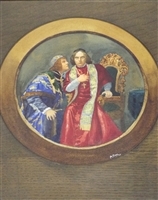 Henry Parker and published by E Charnley, Newcastle. 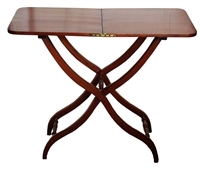 A 19th Century Folding Mahogany Coaching Table Campaign Table in very good condition. repair to the table top as shown in the second and third pictures. Frederick the Great of Prussia arrives in Elysium shortly after his death and meets his own ancestors and other historic personalities. This is a beautiful matching pair of Shibiyama lacquered wall plaques with bone and mother of pearl inlay. Original Jadeite Scottie Dog Child's Tea Set by McKee. Chinese Dehua Porcelain Blanc de Chine Double Dragon Flaming Pearl Vase. This tall baluster shape vase, with lotus leaves and intricate ruffled edges. 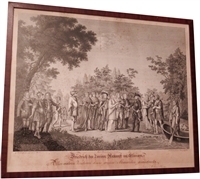 After P Mathews, The Trial of Bill Burn, 1838 Charles Hunt, engraver & Ackerman & Co Printer. The original painting was probably painted for Lady Lyttleton of Hagley Hall. Burns was found beating his donkey and the Trial of Bill Burns was the first prosecution under the 1822 Martin's Act for cruelty to animals. 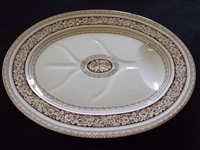 This is a superb 1868 Antique Victorian 31 Piece Dinner Service Beech & Hancock Grecian Pattern. 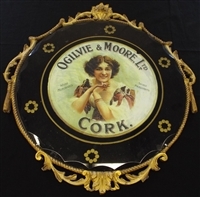 It is very rare to find such a complete, useable, dining service. Beech & Hancock were active from 1857 to 1876. 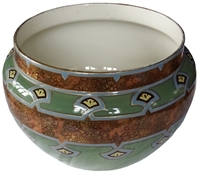 This is the Grecian pattern and each piece is marked underneath with the B&H Garter mark, dating it to 1868. 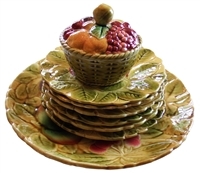 The dinner service comprises 5 serving platters, 1 centrepiece, 2 lidded tureens, 1 lidded sauce boat on stand, 6 dinner plates, 6 luncheon plates & 6 side plates. 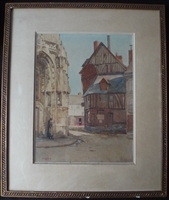 A rare Philip Mitchell (1814-1896) Victorian watercolour of a town scene, signed to the bottom left P Mitchell. 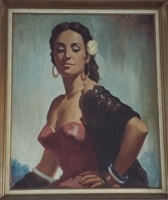 A gorgeous oil painting of a Spanish lady from the 1960's in the Tretchikoff style. An Art Deco Chrome 'Odeon' fitting with two green glass lights. Very evocative of the period. 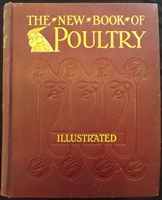 This item is The New Book of Poultry by Lewis Wright published in 1905 by Cassell & Company. It has 600+ 8 pages. Hardcover original decorated cloth, with blindstamping and goldprint on spine and frontboard, with all edges gilt. All pages and illustrations are intact. After Sir Oswald Walters Brierly, a coloured lithograph entitled Revel from Nargen Island, published by Day & Sons, 1855.
central panels are surrounded with a red lacqueur border. This is a wonderful copy of Switzerland: Its Mountains And Valleys, by Woldemar Raden 1878 illustrated by A Gloss. There are 487 pages and 418 illustrations. It was published by Bickers & Son, London. A limited edition copy, 35 of 1000, of the Hertfordshire County Edition of the Domesday Book, published 1987/1988 by Alecto Publishing. This set is finished to a high quality and illustrated throughout, containing two volumes: The Domesday Studies & Folios & Maps.The set comes in a solid slipcase and original packaging. A Padouk wood Anglo-Indian/Burmese carving probably dating to around 1870.
carved piece of wooden furniture. We also have two smaller fragments for sale - please see our other listing. Watercolour painting of a cardinal signed A W Dean 1908 presented in a trompe l'oeil oval within an ornate oak frame. 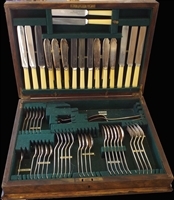 An antique boxed silver plate Frank Cobb & Co 69-piece canteen of cutlery dating from around 1907.